PORTLAND, Maine—Everyone knows that blueberries are high in antioxidant capacity. In fact, it made them famous as a superfruit around the world. But did you know that Aronia berries are three times higher? Aronia what? Chances are you’ve never heard of these super dark berries–but that’s about to change. 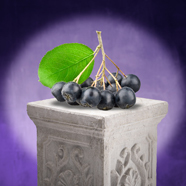 Artemis International, a specialized marketer of dark-pigmented, health promoting berry-based ingredients in the US and a leading provider of Elderberry and Black Currant in North America, has hired the Food and Wellness Group to shine a spotlight on Aronia, a berry that is a health icon in Europe, yet virtually unknown in its native territory, America. This very dark, very tart-tasting berry leads all other berries in anthocyanin and proanthocyanin content, two flavonoids that have demonstrated antioxidant and anti-inflammatory properties and a wide range of potential benefits including heart health and cancer prevention. And, it has triple the well-recognized antioxidant capacity level of blueberries. The choice of the Portland-Maine-based Food and Wellness Group to lead the marketing charge was strategic: this is the team that first developed and marketed the science-based antioxidant (ORAC) and colorful phytochemical story that took wild blueberries from something in a muffin to a global health icon. By hiring the Food and Wellness Group, Artemis International is signaling the world that the US growers and marketers of Aronia are about to change the playing field. With polyphenolic content significantly higher than mainstream fruit like blueberries, cranberries, Concord grapes and pomegranates, as well as other less-familiar exotic superfoods like acai, Aronia has the potential to eclipse all other fruits as the super-healthy ingredient of choice. Jan Mills, President and CEO of Artemis International, is bullish on the future of Aronia. In fact, she was personally involved in the reintroduction of Aronia to its native soil nearly 20 years ago. “We Aronia people tend to be very passionate about our products and the benefits of these dark berries. We’re very excited to work with the Food and Wellness Group and to help this industry take off,” said Mills. Leslie Gallo, Vice President of Operations for Artemis Farms, is looking forward to significantly raising awareness of the industry as a whole. “By bringing the Food and Wellness Group on board with their record of highly successful marketing strategies and programs for wild blueberries, we hope to contribute to the success of the entire Aronia industry by driving up the US demand for what will be an increasing supply over the next few years,” Gallo added. Artemis Farms is the growing, processing and marketing division of Artemis International for Aronia berry products in the US. It will lead the Artemis expansion efforts for Aronia in this country. Centuries ago, Aronia grew wild in the eastern half of the US, prized by native inhabitants for its healing properties. Over time, Aronia faded from notice, only to reappear as a cultivated crop in Eastern Europe, where the market grew and thrived. Aronia extracts, powders, dried and frozen berries are found in products of all kinds—nutritional supplements and nutraceuticals, beverages, jams, jellies, syrups, and dried, sweetened snacks—for European consumers who are well aware of their health benefits. Today, a growing number of farmers throughout the Midwestern US—America’s heartland—and beyond are cultivating Aronia on its native soil, poised for the resurgence of this antioxidant, anti-inflammatory powerhouse. John Sauve, managing partner of the Food and Wellness Group said his marketing team will utilize their years of experience with wild blueberries to help Artemis Farms accelerate awareness and demand for Aronia berries. “We will be working closely with research scientists to further identify and validate the health properties of Aronia,” said Sauve. “These talented researchers and their health-related research will play a major role in advancing the Aronia story as the flavonoid superstar,” he added. The health spotlight is about to start shining on America’s native, yet relatively unknown, Aronia berry.